Herodotus was the first to create a list of the seven most spectacular monuments in the world – or at least, in the world known to the ancient Greeks – but his writings have since been lost. Our traditional set of ancient wonders (listed below) is recorded in a poem by Antipater of Sidon, writing in c.140 BC, though later lists included Roman and then Christian sites. In the 1st century the poet Martial championed the Colosseum, while Medieval theologian Gregory of Tours added the Temple of Solomon and Noah’s Ark. 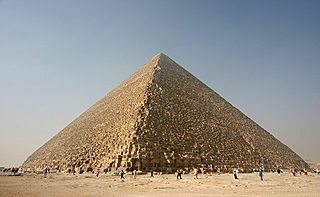 Of Antipater of Sidon’s wonders, only the Great Pyramid at Giza is still standing today. Built in c.290 BC, overlooking the harbour on the Greek island of Rhodes, this enormous statue was more than 30m tall but stood for just 56 years before it was toppled in an earthquake. 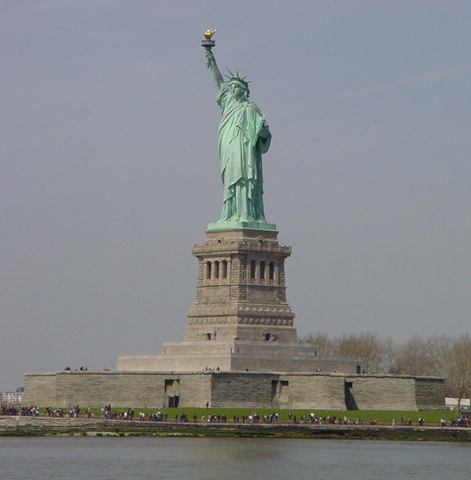 Although the ancient statue depicted the titan Helios, male personification of the sun, it has a rather more feminine descendant: the Statue of Liberty in New York, which is based on 19th-century ideas of what the Colossus looked like. Built in c.2560 BC by the Old Kingdom pharaoh Khufu, this is the oldest and largest of the pyramids that make up the ancient Egyptian necropolis at Giza, just outside Cairo – now a UNESCO World Heritage Site. The Great Pyramid was the tallest man-made construction in the world for almost 4,000 years, until Lincoln cathedral – with its 160m spire – was built in AD 1311. The final resting place of Mausolos of Caria, a 4th-century BC satrap (regional governor) of the Persian Empire, and his sister/wife Artemisia. It is said to have been some 45m tall, its walls decorated with sculpted reliefs, and its pyramidal roof crowned with a huge quadriga – a statue of four horses pulling a chariot. We know very little about Mausolus’ life but his fame has endured through the centuries. His burial place was so magnificent that we now use his name to describe any grand tomb: a ‘mausoleum‘. Built on the island of Pharos between 280 and 247 BC, it stood between 120m and 140m tall and was commissioned by Ptolemy I, one of the Macedonian successors of Alexander the Great, to help guide sailors into Alexandria’s harbour. This wonder was so celebrated in the ancient world that pharos became the Greek word for lighthouse – as well as in many other languages including French (phare), Italian and Spanish (faro), Portuguese (farol) and even Swedish (fyr) and Bulgarian (far). 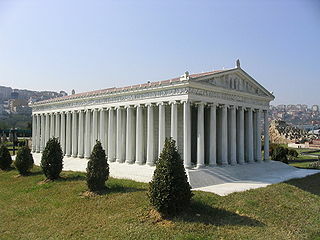 The original temple was destroyed in a flood in the 7th century BC and its reconstruction burned down by the fame-hungry Herostratus (from whom we get ‘herostratic fame’ – seeking notoriety for its own sake) in c.356 BC. 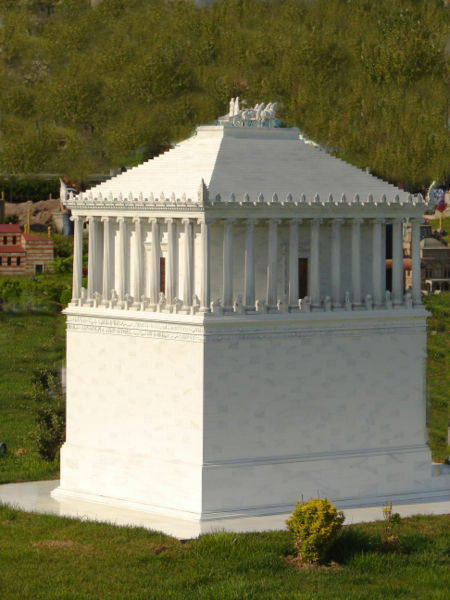 The third and largest phase, begun in 323 BC, created a temple 450ft long by 225ft wide and 60 ft high, with more than 127 columns. It met its final end amidst Gothic raids in AD 268. 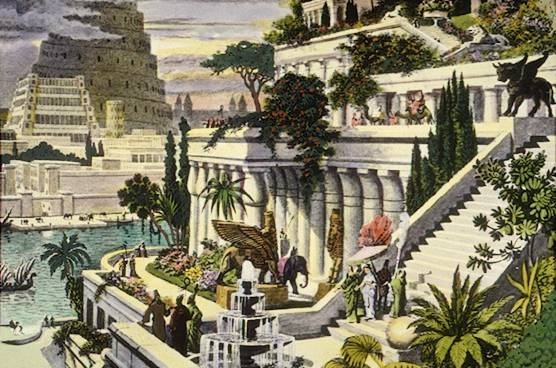 According to Classical sources, the gardens were built by Nebuchadnezzar II (r.605-562 BC) to comfort his homesick wife, Amytis, who missed the plants of her homeland, Media. This is the only one of the Seven Wonders that is likely to have been purely legendary – while the gardens were mentioned by both the Greeks and the Romans – including Strabo and Diodorus Siculus – there are no contemporary references in any of the known cuneiform tablets. Created in c. 432 BC, this enormous chryselephantine (ivory and gold-plated bronze) statue of the seated god – housed in the temple at his sanctuary at Olympia – was some 12m tall. 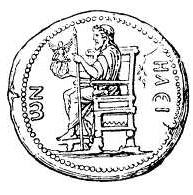 According to Suetonius, the eccentric Roman emperor Caligula wanted to have the statue brought to Rome so he could replace the god’s head with a sculpture of his own. When his men went to carry out this task, the statue laughed so loudly that their scaffolding collapsed and the workers fled.